Come with us for a journey through the Highlands on one of the “great railways of the world”! Climbing aboard this incredible steam train, we'll travel from Fort William - this stunning highland town sits in the shadow of Ben Nevis. Journeying along the shores of Loch Eil, through some of the most beautiful Highland villages to be found, such as Lochailort to Mallaig. 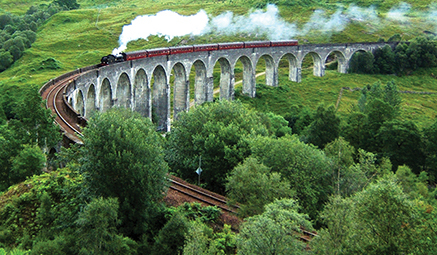 The highlight of the trip will be the crossing of the 21 arch Glenfinnan Viaduct, made famous in the Harry Potter films. Fort William & Jacobite Steam Railway - Full Day - ‘One of the great railway journeys of the world’, taking in classic Highland scenery, dramatic Glencoe and mighty Ben Nevis. 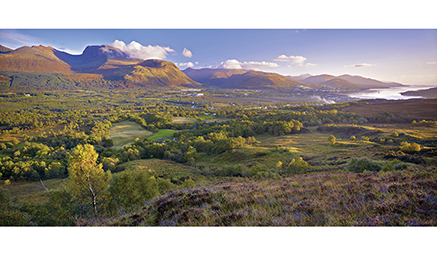 Boarding the train at Fort William, nestled under the shadow of Ben Nevis, we journey along the Jacobite Steam Railway, with stunning Highland scenery, majestic mountains and heather-clad moorland. With a short stop at Glenfinnan, we’ll travel over the 21 arch Glenfinnan viaduct with stunning views down Loch Shiel, before spending the afternoon exploring Mallaig, a charming fishing port.